Editorial: "Why should we publish your case report?" Moráguez, Osvaldo D. / Vailati, Francesca / Belser, Urs C.
This two-part case presentation describes the prosthetic challenge of managing complications in a 50-yearold female patient after inadequate esthetic risk assessment, treatment planning, and implant placement in the anterior maxilla. In Part I, the clinical situation was described, and different restorative solutions were proposed to correct the extreme facial inclination of the implants, excluding major surgical procedures, namely implant removal. In Part II, different prosthetic options are discussed, and the final treatment is revealed. A noninvasive treatment protocol was applied to transform a severely compromised postsurgical situation into an esthetically acceptable result. An unconventional prosthesis design was implemented, including the use of ceramic veneers bonded to the CAD/ CAM -generated screw-retained zirconia- based fixed dental prosthesis (FDP), to correct major axis-related problems and spatial discrepancies. Background: Establishing the diagnosis of a particular clinical situation in the oral cavity must take many characteristics into consideration, with gingival phenotype being an important one because it is linked to every individual's gingival morphogenic characteristics, including soft tissue appearance, genetic characteristics, and the way the gingiva looks after manipulation. Materials and methods: In this study, 294 patients were observed. Fifty patients were selected according to certain exclusion criteria. Patients were submitted to clinical intraoral examinations, and photographs were taken of the anterior maxillary area. Comparing the left and right sides of the anterior maxillary area, the variables analyzed were the crown width/crown length ratio, papilla height, gingival width, gingival thickness, gingival angle, and gingival asymmetry. Results: A statistical relation between gender and gingival thickness was not proven (P > 0.05), neither was that between shape and gingival thickness. However, this relation has statistical significance to gingival thickness and all analyzed variables (P < 0.001), as well as gender and papilla height (P = 0.005), crown width/crown length ratio (P = 0.017), and gingival angle (P = 0.041). A positive relation between the GLA angle measured from both sides was also found (correlation = 0.675), as well as for LID values (correlation = 0.384). The absolute asymmetry value was 2.8 degrees, showing different measurements from each dental arch side. Conclusion: Within the limitations of this study, it can be concluded that there is a strong association between gender and the following variables: crown width/ crown length ratio, papilla height, and gingival angle. It was also demonstrated that a correlation exists between gingival thickness and all the variables studied. Moreover, the influence of tooth form on the gingival characteristics studied was demonstrated. The restoration of anterior teeth is frequently a demanding mission. Patients generally have high expectations for the anterior region, which makes the emotional side of treatment especially important. When this involves discolored endodontically treated teeth, consensus can hardly ever be found as to the chosen approach. Bleaching with direct composites is undoubtedly the most conservative choice for these cases. However, this may require more maintenance (touch-up bleaching and repairs) in the long term, which is an important issue for adult patients. On the other hand, bonded porcelain veneers represent a more 'high-end' option, as they recover the original biomechanics of the intact tooth, allow an optimal masking of the substrate, remain stable, and have a reasonable biological cost when compared to full-coverage crowns. This strategy is explained in this article and documented with a clinical case. We describe treatment planning based on the biomimetic concept, taking into consideration what is possible with current materials and techniques when combined with the patient's particular needs, including the introduction of an innovative step during dentin sealing - the microsuction. The laboratory work was totally accomplished by 'teledentistry', with no direct contact between the dental technologist and the patient. The use of direct composite resin for diastema closure has technique advantages, including that the restorative procedure can be carried out in one appointment at a reasonable cost and without the removal of sound tooth structure. The use of a rubber dam for closing diastemas with composite resin is of paramount importance as it prevents moisture contamination and ensures increased gingival retraction compared to other techniques. This provides better access to the cervical area of the tooth, facilitating proper placement of resin to recreate the natural anatomical contours and contact point. Thus, there is a more natural adaptation of the restoration to the gingival tissue, avoiding a space between the papilla and the restored tooth. To illustrate the advantages of this technique, two diastema closure cases are presented using direct composite resin with rubber dam isolation. Background: The latest trends in restorative dentistry are guided both by esthetic and mini-invasive procedures. New ceramic materials, such as lithium disilicate, allow the clinician to obtain invisible restorations with a minimum preparation thickness. Summary: A young female patient presented at our practice with left temporomandibular closed locking and uncomfortable occlusal instability. After manual reduction, medical therapy, and reversible treatment with a stabilization splint, a mini-invasive lithium disilicate occlusal inferior posterior rehabilitation was conceived and performed. The esthetic integration of the onlay restorations was excellent, no fractures had occurred by the time of the 1-year follow-up, and the patient perceived the dental occlusion as comfortable. Conclusion: We strongly believe that a careful approach to esthetics is mandatory nowadays, including in the case of posterior teeth. New ceramic materials and the latest adhesive techniques make it possible to resort to mini-invasive and esthetic approaches, even in cases of restorations that are difficult in terms of functionality. Purpose: The purpose of this article is to determine whether certain facial asymmetries (nose and chin) have an impact on the perception of the maxillary dental midline shift. Materials and methods: From a digitally created symmetric facial model (SFM) constructed in a previous study, a new asymmetric facial model (AFM) was created, with nose and chin deviated to the same side. Modifications were made on the AFM for shifts in the maxillary dental midline in both directions, resulting in a total of eight different images. Through a web survey, 112 randomly selected laypersons were asked to evaluate each image according to their own personal beauty and esthetic criteria using a visual Likert scale. Results: 1 mm of dental midline shift to the left of the AFM was not noticed; 1 mm of dental midline shift to the right of the AFM had a negative impact on perception of facial attractiveness; 2 and 3 mm of dental midline shift to left or right of the AFM had a negative impact on perception of facial attractiveness. Conclusions: Facial asymmetries such as nose and chin inclinations have an impact on the perception of maxillary dental midline shift. Direction of dental midline shift can be a major factor in this perception. Objective: This study evaluated the influence of Nd:YAG laser on the evaporation degree (ED) of the solvent components in total-etch and self-etch adhesives. Materials and methods: The ED of Gluma Comfort Bond (Heraeus-Kulzer) one-step self-etch adhesive, and Adper Single Bond 2 (3M ESPE), and XP Bond (Dentsply) total-etch adhesives was determined by weight alterations using two techniques: Control - spontaneous evaporation of the solvent for 5 min; Experimental - Nd:YAG laser irradiation for 1 min, followed by spontaneous evaporation for 4 min. The weight loss due to evaporation of the volatile components was measured at baseline and after 10 s, 20 s, 30 s, 40 s, 50 s, 60 s, 70 s, 80 s, 90 s, 100 s, 110 s, 2 min, 3 min, 4 min, and 5 min. Results: Evaporation of solvent components significantly increased with Nd:YAG laser irradiation for all adhesives investigated. Gluma Comfort Bond showed significantly higher evaporation of solvent components than Adper Single Bond 2 and XP Bond. All the adhesives lost weight quickly during the first min of Nd:YAG laser irradiation. 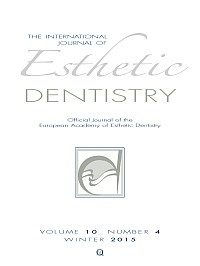 Conclusion: The application of Nd:YAG laser on adhesives before light curing had a significant effect on the evaporation of the solvent components, and the ED of Gluma Comfort Bond onestep self-etch adhesive was significantly higher than with Adper Single Bond 2 and XP Bond total-etch adhesives. Clinical relevance: The use of the Nd:YAG laser on the uncured adhesive technique can promote a greater ED of solvents, optimizing the longevity of the adhesive restorations. Purpose: Perception of maxillary midline diastema as an esthetic trait varies in relation to culture, age group, and racial background. Although midline diastema is accepted in Africa, there are few reports on interethnic perception of midline diastema among Nigerians. Methods: Participants aged 19 to 45 years were selected from six geographical zones of Nigeria; one state was randomly selected from each zone, and a local government area (LGA) selected from each state. A structured questionnaire including a set of color smile photographs with varying sizes of maxillary midline diastema (narrowest = 2 mm; widest = 6 mm) was administered. Information sought was age, gender, socioeconomic group, tribe, presence of a midline diastema, and grading of attractiveness of smile. This information was evaluated using a Likert scale. Results: A total of 402 subjects aged 19 to 45 years and a mean age of 36.3 years (± 0.714) took part in this study. The highest proportion of subjects with midline diastema was aged 21 to 30 years (33.9%), females (29.8%), from the Hausa ethnic group (35%), and from the class II socioeconomic group (31.9%). Among the ethnic groups, Hausa had the highest (65%) preference for midline diastema. Females (58.8%) and those in the class II socioeconomic group (68.1%) also had the highest preference for midline diastema. There was a strong relationship between incidence of and preference for midline diastema (P = 0.000). All ethnic groups rated maxillary midline diastema as attractive, especially when the width was within 2 to 3 mm (P = 0.02). Conclusion: All ethnic groups perceived maxillary midline diastema to be an esthetic attribute, provided the width was within 2 to 3 mm.